Worldwide hazard modeling and multi-hazard risk assessment. for individual facilities, portfolios, and networks. Seismic vulnerability models for use in HAZUS and proprietary loss software. Decision support using cost-benefit ratio, IRR, certainty equivalent, with single- or multi-attribute objectives. We design risk-management alternatives and perform economic and life-safety analyses on the basis of cost-benefit ratio, internal rate of return, certainty equivalent, cost per statistical life saved, and other formal decision bases. We provide decision-making information that is understandable, defensible, and actionable. We provide expert independent review of risk assessments. Charles Scawthorn gave a luncheon address on the state of catastrophic fire in the US to the Passe Club of the National Association of Insurance Commissioners on Nov. 16 at the Hilton on Union Square, San Francisco. The text of his address can be accessed here. Keith Porter conducted a guest seminar Nov. 9 on the subject of earthquake risk mitigation at the University of British Columbia (Vancouver) at the invitation of Prof. Stephanie Chang. 11NCEE (11th National Conference on Earthquake Engineering): Keith Porter and Charles Scawthorn played an active role at 11NCEE held in Los Angeles 25-29 June 2018. Scawthorn co-chaired a session with Dr. Craig Davis of LADWP on the topic of Achieving Water Supply Network Seismic Reliability and Resilience, where he presented a paper on the topic of the PIPE algorithm (Pipe Importance and Priority Evaluation), available here, and Porter presented a paper on "Will the San Francisco East Bay Water Supply Go Haywire?, available here. Both Scawthorn and Porter also presented papers in the Innovations Of The HayWired Scenario session, where Porter's paper was "Basic Research from the Haywired Scenario to Better Inform Resilience Plans" available here, and Scawthorn's paper was "Fire Following the Mw 7.0 Haywired Earthquake", available here. Institute for Catastrophic Loss Reduction. Charles Scawthorn on June 15, 2018 presented a 90 minute webinar for ICLR on the topic of Conflagrations. The talk had two parts, conflagrations in the Wildland Urban Interface (WUI) and conflagrations following earthquakes. The entire 90 minute talk can be viewed here. American Water Works Association. Charles Scawthorn on June 13-14, 2018 made two presentations at the AWWA Annual Meeting in Las Vegas, on the topic of the PIPE algorithm (Pipe Importance and Priority Evaluation), a new method that solves for the first time the question of how to identify which pipe has the highest benefit if mitigated. The two papers are available here and here. Haywired Report release. Keith Porter represented the Engineering team at the April 18 release of the USGS-sponsored major report The HayWired earthquake scenario—Engineering implications which describes a hypothetical yet scientifically realistic earthquake sequence scenario in order to better understand hazards for the San Francisco Bay region during and after a magnitude-7 earthquake (mainshock) on the Hayward Fault and its aftershocks. Findings, many due to work by Porter, include: (1) 800 deaths and 16,000 nonfatal injuries result from shaking alone, plus property and direct business interruption losses of more than $82 billion from shaking, liquefaction, and landslides; (2) the building code is designed to protect lives, but even if all buildings in the region complied with current building codes, 0.4 percent could collapse, 5 percent could be unsafe to occupy, and 19 percent could have restricted use; (3) people expect, prefer, and would be willing to pay for greater resilience of buildings; (4) more than 22,000 people could require extrication from stalled elevators, and more than 2,400 people could require rescue from collapsed buildings; (5) the average east-bay resident could lose water service for 6 weeks, some for as long as 6 months; (6) older steel-frame high-rise office buildings and new reinforced-concrete residential buildings in downtown San Francisco and Oakland could be unusable for as long as 10 months; (7) combining earthquake early warning (ShakeAlert) with “drop, cover, and hold on” actions could prevent as many as 1,500 nonfatal injuries out of 18,000 total estimated nonfatal injuries from shaking and liquefaction hazards. (8) SPA’s Charles Scawthorn was author of Chapter P of the report, which focused on fire following earthquake, finding about 450 large fires could result in a loss of residential and commercial building floor area equivalent to more than 52,000 single-family homes and cause property (building and content) losses approaching $30 billion. Volume 1 of the report, on Earthquake Hazards, was released in 2017, and Volume 3 will be released later this year. Water System Seismic Conference. Charles Scawthorn presented a paper at the 10th Water System Seismic Conference in Tainan City, Taiwan, October 2017, sponsored by the Taiwan, Japan and American Water Works Associations, on the topic of " Determining Water Distribution System Pipe Replacement Given Random Defects – Case Study of San Francisco’s Auxiliary Water Supply System ". ASCE Pipelines 2017. Charles Scawthorn is co-author of a paper , 'Water Distribution System Pipe Replacement Given Random Defects - Case Study of San Francisco's Auxiliary Water Supply System', for the 2017 Pipelines Conference in Phoenix, Arizona in August 2017..
Natural Hazards Workshop. Keith Porter and Charles Scawthorn both participatedin sessions at the Workshop, convened each July by Natural Hazards Center of the University of Colorado. Porter will be moderating a session on the Mitigation Saves project (click here ) and Scawthorn will be moderating a session on the Global Alliance for Disaster Research Institutes (GADRI, click here ). Geller Fest. Charles Scawthorn gave a presentation at the May 2017 retirement party for Prof. Robert Geller of the University of Tokyo, speaking on "An engineer looks at M-S-G (2017)'s criticisms of PSHA"
GADRI. Charles Scawthorn attended the 3rd Global Summit of the Global Alliance for Disaster Research Institutes (GADRI) in Kyoto in May. He serves on the GADRI Board, and chaired a session during the Summit. Haywired. Keith Porter and Charles Scawthorn both participated in the first "All-Team" kick-off meeting for the HayWired scenario on April 24, 2017 at East Bay Municipal Utilities District in Oakland, sponsored by the USGS, Association of Bay Area Governments, Joint Venture Silicon Valley, Pacific Earthquake Engineering Research Center and the State of California Seismic Safety Commission. Porter is lead on the Engineering aspects of the project, and Scawthorn leads the investigation on fire following earthquake. Mitigation Still Saves. SPA Risk LLC is updating and expanding the classic 4:1 benefit-cost analysis of natural-hazard mitigation for the National Institute of Building Sciences. To learn more, read this. Berkeley Guest Lecture 21 Sept. 2016. Charles Scawthorn gave a Guest Lecture to CE 105 "Wind and Water - Design for a Changing Environment“on the topic of Emergency Water Storage and Supply, at the invitation of Prof. Sally Thompson. A pdf of the lecture can be found here. A state-wide emergency water supply system is needed. National Institute of Standards and Technology (NIST). SPA’s Charles Scawthorn gave an invited talk at NIST in January 2016 on the topic of fire following earthquake. Dr. Scawthorn’s talk emphasized the following points: Fire following earthquake is a significant problem in the seismic portions of the US, particularly in urban regions such as San Francisco and Los Angeles. It is potentially the largest source of loss in a major earthquake, and is a major driver for emergency responders, water agencies and catastrophe insurers. Approximately 1,600 ignitions are expected in greater Los Angeles following a major earthquake on the southern San Andreas Fault, and a comparably large number of ignitions following a major earthquake in the San Francisco Bay Area. This and related work have identified major needs related to water distribution systems, to which a number of water agencies are now responding. Structural Engineers Association of Southern California (SEAOSC). On November 5, 2015, SPA's Keith Porter gave the concluding plenary presentation to the 2015 SEAOSC Summit Strengthening Our Cities. The presentation, entitled Dollars, deaths, and downtime: understand your building's seismic risk and how to evaluate it, summarized for building owners and managers the history and current direction of seismic evaluations for buildings, especially the PML-type study. Understanding Risk: Boulder. On October 25, 2015, SPA's Keith Porter moderated a session in an Understanding Risk symposium on the subject of citizen science and natural-hazard risk and how to crowdsource natural-hazard risk modeling. See the ignite presentation here. Global Alliance for Disaster Risk Insitutes (GADRI). On October 13, 2015, SPA's Charles Scawthorn attended an organizing meeting of GADRI held at Kyoto University's Disaster Prevention Research Intitute (DPRI), Uji, Japan. GADRI is a new alliance of over 50 DRI's around the world, who are organizing to promote disaster reduction science and its outreach to agencies and governments. Structural Engineers Association of Northern California (SEAONC). On October 6, 2015, SPA's Keith Porter spoke at SEAONC's October Dinner Meeting, presenting a talk entitled Lessons of the HayWired Scenario: Performance of New Buildings, Public Expectations, and 3-D Ground-Motion Maps. He made the case that (1) current life-safety design objectives will lead to a severely impaired building stock in large but not exceedingly rare urban earthquakes; (2) the public expects and is willing to pay for better performance; (3) 50% stronger buildings can meet a 95% shelter-in-place objective for about 1% more cost; and (4) stronger design might be highly cost effective. Workshop on Fire Following the Mw 7 "Haywired" Earthquake. As part of the Haywired project for the USGS, SPA's Charles Scawthorn and Keith Porter organized a Workshop on Oct. 29 in Berkeley California. The Workshop was co-sponsored by the USGS, UC Berkeley's Pacific Earthquake Engineering Research (PEER) Center, the California Governor's Office of Emergency Services (OES) and the California Seismic Safety Commission, and focused on work in progress to estimate the number of fires and their spread that would result from a hypothetical Mw 7 earthquake on the Hayward Fault in the East Bay portion of the San Francisco Bay Area. The Haywired Project is the latest in the series of USGS Science Application for Risk Reduction projects, in which Keith Porter is the lead for engineering aspects. The power point presentations for the workshop are available on SPA's publications page here. 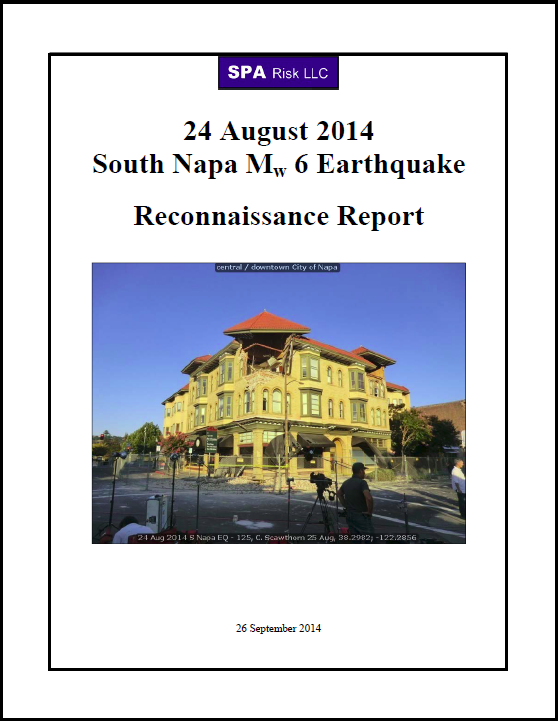 Napa earthquake reconnaissance report. A magnitude Mw 6.0 affected the northern portion of the San Francisco Bay Area at 3:20 AM on 24 August 2014. SPA's Charles Scawthorn visited the affected region, examined buildings and lifelines, spoke with fire departments, utility operators, and others. Shaking in some places reached design-level (fairly rare) motion, up to 5 times what would have been calculated for an earthquake of this magnitude. The earthquake caused one fatality and about 13 hospital admittances in Napa, with several hundred people requiring medical assistance. In the historic city of Napa, it caused substantial damage to ordinary buildings, and very heavy damage to a number of historic masonry buildings, although some retrofitted masonry buildings had very little or no damage. Approximately 116 buildings were red-tagged (unsafe to enter or occupy) and over five hundred yellow-tagged (limited entry), meaning that 2% of the Napa building stock was impaired by this not-very-rare earthquake. Infrastructure was variously affected, with perhaps the water system having the most damage, with approximately 160 water main breaks. 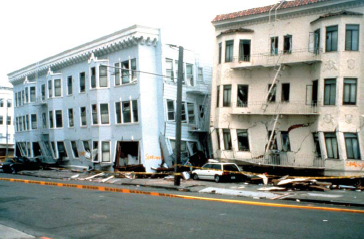 Similar damage has been observed in several historic California earthquakes; some of it could have been readily prevented. See our publications page for the report. SAFRR tsunami scenario is released. This new disaster planning scenario from the USGS and partners depicts the potential effects in California of a tsunami generated by a M9.1 Alaskan earthquake. Some include: 15 ft amplitudes, days of strong currents, 1/3 of small boats damaged or sunk, $4-5 B property damage and $1-5 B in business interruption losses,1800 blocks inundated wetting the equivalent of 70,000 single-family dwellings, 5 miles of roads damaged including the San Francisco Bay Bridge toll plaza, $100 million in damage to the Ports of Los Angeles and Long Beach, and only 2 to 4 hours' warning time. This is the USGS Science Application for Risk Reduction (SAFRR) program's 3rd major disaster scenario. It represents the effort of more than 150 earth scientists, engineers, and social scientists from more than 40 public and private entities. SPA's Keith Porter led the assessment of physical damage. SPA's Charlie Scawthorn led the assessment of fire following tsunami. See our publications page for the report and related documents. Contact us for a briefing (like this one) on what your organization can learn from the SAFRR tsunami scenario. San Francisco's Board of Supervisors unanimously approve the Mandatory Soft Story Retrofit Ordinance. The ordinance grew out of the Community Action Plan for Seismic Safety, which SPA's Charlie Scawthorn helped to lead, and the soft story portion of the study, for which Keith Porter performed the risk analyses. The ordinance requires the evaluation and strengthening of soft-story, high-occupancy woodframe dwellings like the kind that collapsed in the Marina District in the 1989 Loma Prieta earthquake. Mayor Ed Lee signed it into law on April 18, 2013, the 107th Anniversary of the 1906 Great San Francisco Earthquake. This ordinance will almost certainly save lives and homes, and we could not be more proud to have been involved. Contact us to explore whether your buildings are at risk in the Big One. Helping to shape the Department of the Interior's Strategic Sciences Group. In March 2012, SPA's Keith Porter participated in a workshop with a small group of scholars and scientists to shape the newly created Department of the Interior Strategic Sciences Group (SSG). SSG is intended as a scientific rapid-response group to provide the Department of the Interior with science-based assessments of crises affecting Departmental resources. Its formation was motivated by the success of an ad hoc group that provided Interior with an independent assessment of scientific issues surrounding the Deepwater Horizon catastrophe of 2011. ROVER is now platform-independent. 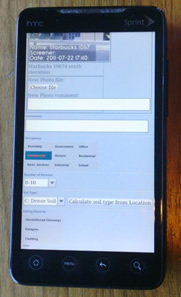 ROVER (Rapid Observation of Vulnerability and Estimation of Risk), the FEMA-sponsored software for performing pre- and post-earthquake rapid safety assessments on mobile devices, is now platform independent, operating on virtually any Android, iPhone, iPad, Blackberry, and Windows device with an active data connection. ROVER brings the advantages of smartphones to the de facto paper-based standards for safety screening and tagging of buildings, FEMA 154 and ATC-20. ROVER integrates these two paper-based standards with HAZUS-MH and ShakeCast, and adds various advantages of a software solution: built-in soil and seismology geodatabases, unlimited watermarked and captioned digital photos, automatic geolocation, real-time process control, a secure web-accessible database, and other features. Visit www.roverready.org to download the software and to view assessments by independent testers of the software. Water Supply In Regards to Fire Following Earthquakes. On 10 November 2011 Charles Scawthorn presented the final report on Water Supply In Regards to Fire Following Earthquakes to the California Seismic Safety Commission. The report summarizes research Scawthorn conducted at the University of California at Berkeley's Pacific Earthquake Engineering Research Center (PEER), where he is a Visiting Scholar. Key findings were that both fire and water agencies in urban California expect water distribution systems to fail following a major earthquake, but that not enough is being done. A recommended program of action to improve this situation was approved by the Commission, and will be implemented in the coming year. The full report is available here, and a four page summary is available here. Soft-Story Buildings at Risk. SPA's Keith Porter spoke about the Community Action Plan for Seismic Safety's Soft-Story Program at the Structural Engineers Association of Southern California Buildings At Risk Earthquake Loss Reduction Summit, at USC in Los Angeles, on 13 October 2011. Dr Porter's talk covered the engineering issues, but also addressed broader lessons from CAPSS about formulating and enacting a mandatory mitigation policy that could be adopted in local building codes. His comments are available here. National Insurance Conference of Canada: SPA's Keith Porter spoke in a plenary session of the the 5th annual NICC in Vancouver, 25-27 September 2011. Dr Porter spoke on the subject of ShakeOut, Tohoku, and their Implications for Canada. He offered lessons on how to make a similar planning scenario for British Columbia effective. More information on the conference can be found here. Dr Porter's remarks can be viewed here. National Academy of Sciences Summit for Managing Extreme Events: SPA's Charles Scawthorn and Keith Porter attended this Washington, DC event on 7-9 September 2011, which brought together leaders from the research, policy, and re/insurance communities with expertise in various aspects of extreme events. By convening the resources and talents of the diverse communities involved in predicting, managing, and ultimately paying for extreme events, the NAS hopes to create cross-sectoral partnerships and find ways to reduce risk to extreme events. One outcome appears to be a plan to create a hurricane planning scenario. SPA Risk publishes a report on the Tohoku Earthquake. SPA's Charles Scawthorn and Keith Porter have prepared a report on the effects of the 11 March 2011 Tohoku Earthquake. The report summarizes the seismotectonics, ground-shaking and tsunami runup, and addresses in detail the impacts of the earthquake on lifelines, fire following earthquake, and economic impacts. The report is available here. International Insurance Society 47th Annual Seminar: SPA's Keith Porter spoke on the Tohoku Earthquake and its implications for the United States. This seminar, held in Toronto Canada on 19-22 June 2011, focused on new global opportunities for the insurance industry. Porter spoke in an panel that dealt with how science can help insurers enhance communities' resiliency to natural catastrophes. His remarks can be viewed here. More information on the seminar can be found here . 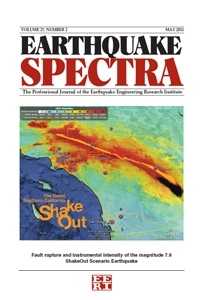 Earthquake Spectra special issue published on the ShakeOut Scenario: SPA's Keith Porter led a group of guest editors for this issue of earthquake engineering's leading scholarly and professional journal, which included SPA’s Scawthorn. Both Porter and Scawthorn contributed to the unusually large issue (20 manuscripts), which highlights scientific and professional advances and interdisciplinary work among the earth-science, engineering and social-science disciplines. The journal contents can browsed here; and full text of Porter's and Scawthorn's contributions can be found here. 9th Conference on Catastrophe Insurance in Asia: SPA's Charles Scawthorn gave a keynote talk on Lessons to be Learnt from the Recent Eastern Japan Earthquake and Tsunami, at the 9th Conference on Catastrophe Insurance in Asia. The conference was held 8-9 June at The Westin Chaoyang in Beijing, and had the theme "Responding to the New Normal in Catastrophes in Asia. More information is available here. May 2011 World Reconstruction Conference, Geneva: SPA's Charles Scawthorn spoke on the topic of Critical Infrastructure at the World Reconstruction Conference, held in Geneva as part of the UN ISDR's 2011 Global Platform for Disaster Reduction. His remarks can be viewed here. HAZUS Open Source Committee Chair, National Institute of Building Sciences: SPA's Charles Scawthorn has been invited to chair the HAZUS Open Source Committee, for the National Institute of Building Sciences (NIBS). The Committee will advise NIBS and FEMA on ways in which HAZUS source code can be opened to selected users, as a first step to broadening the HAZUS development base, in order to enhance HAZUS in a more timely manner. May 2-3, 2011 Seismic Risk Mitigation Leadership Forum, San Francisco: SPA's Charles Scawthorn will present a major talk at this 400 person conference at the San Francisco Hilton, on the topic of fire following earthquake. The Seismic Risk Mitigation Leadership Forum is part of a national series of insurance industry sponsored meetings to promote natural hazards loss reduction. featuring experts from a range of disciplines to examine mitigation best practices, public policy efforts, communication success stories, and earthquake risk research. The program speakers include Mayor Edwin Lee (City of San Francisco), Mayor Jean Quan (City of Oakland), and Nancy Ward (Federal Emergency Management Agency Regional Director, Region IX). March 11, 2011 Japan Mw 9 Earthquake and Tsunami: SPA's Charles Scawthorn and colleagues have returned from an initial survey of the area affected by the earthquake and tsunami. A brief initial report of their findings is available here, Dr. Scawthorn's presentation at the PEER 28 April briefing at the University of California at Berkeley may be viewed in this 24 minute video, and approximately 2,400 georeferenced photos may be viewed here. March 2, 2011: Open-source risk vs. Proprietary risk models, a talk presented by Charles Scawthorn as part of a Distance Learning Seminar Series on Disaster Risk Management in East Asia and the Pacific, sponsored by the World Bank. Dr. Scawthorn spoke in favor of Open Source Risk Models to an audience at many places around the world, including Indonesia (Jakarta), Lao PDR (Vientiane), Thailand (Bangkok), Vietnam (Hanoi), Cambodia (Phnom Penh), China (Beijing), Mongolia (Ulaanbaatar), Philippines (Manila), Singapore (Singapore), Japan (Tokyo) and Fiji (Suva). View the 33 minute presentation here. March 3-4, 2011: GEM Ontology and Taxonomy (O&T) Workshop: A Workshop focusing on the Global Earthquake Model Taxonomy will be held at the Pacific Earthquake Engineering Research Center (University of California at Berkeley) to review an initial proposal for the GEM Taxonomy, and develop selected portions of the Taxonomy. SPA's Charles Scawthorn is Principal Investigator for the GEM O&T project, which is being performed by a consortium headed by the Alliance for Global Open Risk Analysis AGORA. For more information on the O&T project see the GEM O&T website . February 2011: Human Casualties in Earthquakes: Together with Prof. Robin Spence of Cambridge University (UK) and Dr. Emily So (USGS), SPA Principal Charles Scawthorn has co-edited a volume on Human Casualties in Earthquakes. The volume is a compendium of two international workshops held in Kyoto, Japan (2007) and Cambridge (2009) on the state-of-the-art, with contributions from more than 40 international experts. The volume is published by Springer, and more information can be found at Human Casualties in Earthquakes. January 2011: California Seismic Safety Commission: On Thursday January 13th at the State Capitol, Sacramento, Charles Scawthorn provided a status report on a project he is leading for the Seismic Safety Commission and the Pacific Earthquake Engineering Research Center (PEER, at the University of California at Berkeley). The project is an inquiry into the reliability of post-earthquake firefighting water supply, and entitled Water Supply in regard to Fire Following Earthquake. January 2011: The ARkStorm Summit. SPA Principal Keith Porter spoke at and moderated breakout sessions at the ARkStorm Summit in Sacremento, CA, on January 13 and 14, 2011. ARkStorm (California’s other “Big One”; video here) is an emergency planning scenario developed by the US Geological Survey, National Oceanic and Atmospheric Administration, California Geological Survey, a number of California utilities, and others. It hypothesizes a severe winter storm similar to the megastorm that struck California in 1861-1862, and somewhat smaller than 6 California storms of the last 1800 years. The scenario is documented in USGS Open File Report OFR-2010-1312, for which Porter is 1st author, available here. It estimates realistic impacts in such an event of $400 billion property loss plus $600 billion in business interruption losses; 1.5 million Californians displaced; 25% of California property affected by flooding; and virtually every California county and economic sector affected in some way. The two-day ARkStorm Summit served as venue for the offical release of the ARkStorm Scenario. 250 invited guests from the public and private sector joined together to plan action as a result of the scenario’s findings. Speakers and guests included the USGS Administrator; a Congresswoman, the California Treasurer's Director of Pubilc Finance, as well as emergency managers, regulatory and scientific agencies, policymakers, business leaders, and other experts from the public and private sector. See http://urbanearth.gps.caltech.edu/arkstorm-summit/ for more information. Contact us for a private briefing on what your organization can learn from the ARkStorm Scenario. December 2010: SPA plays a leading role in development of Global Earthquake Model: Principals Charles Scawthorn and Keith Porter are both playing leading roles in the development of Global Earthquake Model (GEM). Porter heads a global consortium for development of seismic Vulnerability functions for GEM, while Scawthorn heads a global consortium for development of the theoretical and building classification underpinnings of GEM, termed the GEM Ontology and Taxonomy. Both of these projects were kicked off by Porter and Scawthorn during the GEM Global Components meeting in Singapore 1-3 December. Scawthorn is also coordinating US data collection for the GEM Consequences database project, while Porter is participating in the Data Collection Tools project. For more information about GEM see www.globalquakemodel.org . December 2010: Communicating Science to Nonscientists (or, Ten Tips for Talking to Townies). Keith Porter presented at the 2010 Fall Meeting of the American Geophysical Union some lessons learned from the USGS' Multihazards Demonstration Project about risk communication. The presentation, co-authored with Lucy Jones of the USGS, is available here. November 2010: Analysis of Fire Following Earthquake Potential for San Francisco, California: SPA led an analysis of the potential losses due to fire following earthquake in the City of San Francisco, for the City's CAPSS (Community Action Plan for Seismic Safety) project. A stochastic model for analyzing fire following earthquake for San Francisco was developed to assess fire following earthquake impacts due to four earthquake scenarios: magnitude 7.9, 7.2 and 6.5 events on the San Andreas fault near San Francisco, and a magnitude 6.9 event on the Hayward fault. Depending on the specific earthquake scenario, over 1,000 breaks in the potable water system may occur and losses that for example for the Mw 7.9 event (essentially a repeat of the 1906 earthquake) are on average about $7.6 billion, and half the time will be as much as $10.3 billion. Opportunities were identified for reducing the fire following earthquake risk, including further improvements in reliability of post-earthquake water supply, further support for NERT, and greater training for this problem for SFFD officers and firefighters. Copies of the report are available (contact cscawthorn@sparisk.com) and will soon be published by the City and the Applied Technology Council. November 2010: FEMA Loss Avoidance Study (LAS) vetted. SPA Principal Keith Porter participated in a FEMA workshop to review its draft guidelines for documenting losses avoided by earthquake mitigation projects. The FEMA LAS earthquake guidelines will ultimately be encoded in software to facilitate the creation of LASes by owners of retrofitted facilities. October 2010: Urban Renewal and Disaster Risk Mitigation: Entities and Financing: SPA Principal Charles Scawthorn participated in a Working Symposium on Urban Renewal and Disaster Risk Mitigation October 17-19 at Bogazici University, Istanbul, Turkey. The Symposium, organized by the Affordable Housing Institute of Boston, MA, sought to develop innovative approaches combining urban renewal and disaster mitigation. October 2010: PBEE-2 analytical downtime model delivered to Kajima Corp: SPA Principal Keith Porter delivered report presenting a 2nd-generation performance-based earthquake engineering (PBEE-2) approach to estimating the time to restore a critical facility to functionality after an earthquake. The method begins at completion of the PBEE-2 damage analysis, takes as input the damage state of all critical components, and uses a fault tree to assess post-earthquake operability. Click here for a copy of the report. September 2010: ROVER Demonstration Project exercises ROVER for Utah schools. SPA Principal Keith Porter helped coordinate this demonstration project of FEMA's mobile software Rapid Observation of Vulnerability and Estimation of Risk (ROVER). ROVER was exercised on a sample of Utah schools for the benefit of the Utah Seismic Safety Commission and the Utah Schools Rapid Visual Screening (RVS) Committee. In the exercise, 17 engineers and other building officials were carried out ROVER screenings of a stratified sample of school buildings, considering era of construction, geographic area, and public versus charter-school operation. In 2 days, 139 school buildings were examined, of which 66 (47%) were deemed to need additional detailed evaluations. This high percentage will help support Utah's efforts to have a systematic approach to Utah school seismic evaluations. September 2010: California Seismic Safety Commission on Water Supply in regard to Fire Following Earthquake: SPA Principal Charles Scawthorn is leading development of a White Paper for the California Seismic Safety Commission that will qualitatively review the current status of emergency water supply in California vis-à-vis fire following earthquake, and provide a series of recommendations for improvements if/where needed. The White Paper is being developed in collaboration with the Pacific Earthquake Engineering Research Center (PEER) of the University of California at Berkeley, where Scawthorn is a Visting Scholar. August 2010: ROVER presented at 9th US National/10th Canadian Conference on Earthquake Engineering (9USN10CCEE). SPA Principal Keith Porter presented FEMA's mobile software Rapid Observation of Vulnerability and Estimation of Risk (ROVER) at the 9US10CEE. Click here for a copy of the proceedings manuscript. August 2010: ROVER presented at 3rd Annual HAZUS Users' Conference. SPA Principal Keith Porter presented FEMA's mobile software Rapid Observation of Vulnerability and Estimation of Risk (ROVER) at the annual HAZUS Users' Conference in Indianapolis, IN. June 2010: Extreme Precipitation Symposium. SPA Principal Keith Porter presented the ARkStorm to 200 California flood control and water resource managers, as part of this annual symposium at the University of California at Davis. The ARkStorm is a winter-storm planning scenario that hypothesizes a repeat of the severe winter storm that struck California in the winter of 1861-1862, left the Central Valley impassible, destroyed 1/3 of taxable land in the state, and produced widepsread flooding in Los Angeles, Orange, and Bay Area counties. Such an event could conceivably result in $750 billion of property loss and business interruption, necessitate the evacuation of 1.5 million Californians, and cause long-term harm to the California economy. A USGS Open File Report on the ARkStorm is scheduled for publication in January 2011. June 2010: Understanding Risk Conference, World Bank: SPA Principals Charles Scawthorn and Keith Porter participated in the Understanding Risk Conference organized by and held at the World Bank, Washington, DC June 1-6, 2010. Scawthorn together with Dr. Brian Tucker of Geohazards International engaged in a "talk-show format" discussion of "who are the users of the Global Earthquake Model and what are their needs?". May 2010: Lloyd's California Earthquake Insurance Seminar in San Francisco. SPA developed and led a week long seminar for Lloyd's underwriters, adjusters and insurance executives on earthquake risk in general and specifically in California. The seminar included guest lectures by the California Earthquake Authority, Seismic Safety Commission, USGS Chief Scientist for Southern California, San Francisco Fire Department as well as a dinner presentation by famed author James Dalessandro. Click here for the Lloyds Market Association 44 page report on the topic. February 2010: Institute for Catastrophic Risk Management Launch, Singapore: SPA Principle Charles Scawthorn was invited to participate in the launch of Nanyang Technical University's Institute for Catastrophic Risk Management in Singapore, where he participated in a panel discussion on issues of Cat Risk in South East Asia. October 2009: SPA contributes to KPIX-TV's article, Dispelling the Myths of the Loma Prieta Earthquake. Click here for the 6-minute video. June 2009: NAIC Study re National Catastrophe Loss Estimation Model: SPA provided a report to the National Association of Insurance Commissioners (NAIC) on the feasibility of developing a national catastrophe loss estimation model for use by insurance regulators. The study was performed in association with Karen Clark and Company, who addressed hurricane modeling while SPA addressed earthquake loss modeling. Click here for a Business Insurance news article on the report..
November 2008: SPA develops ROVER for FEMA. SPA pilot tested the Rapid Observation of Vulnerability and Estimation of Risk (ROVER) software with the Los Angeles Unified School District, as part of LAUSD's participation in the Great Southern California ShakeOut. ROVER is open-source software for Windows Mobile smartphone and PC to implement and enhance the FEMA 154 tool for pre-earthquake rapid visual of buildings for potential seismic risk. ROVER also implements and enhances the ATC-20 post-earthquake building safety evaluation procedure. ROVER will ultimately integrate with the US Geological Survey's free ShakeCast software. Among other tasks, ShakeCast watches USGS Internet servers for notice of the occurrence of earthquakes that can damage a user's portfolio of facilities, estimates safety tag color, and automatically alerts users with its damage estimates via email or SMS. In 2 days surrounding the ShakeOut, LAUSD inspectors tested both the pre- and post-earthquake modules of ROVER on a campus of school buildings in the San Fernando Valley, demonstrating that the system works and can facilitate LAUSD's efforts to manage its seismic risk. ROVER has been developed in collaboration with the Federal Emergency Management Agency, Applied Technology Council, and Instrumental Software Technologies, Inc. For a brief overview, click here. For more detail, click here. October 2008: SPA leads the development of OpenRisk. 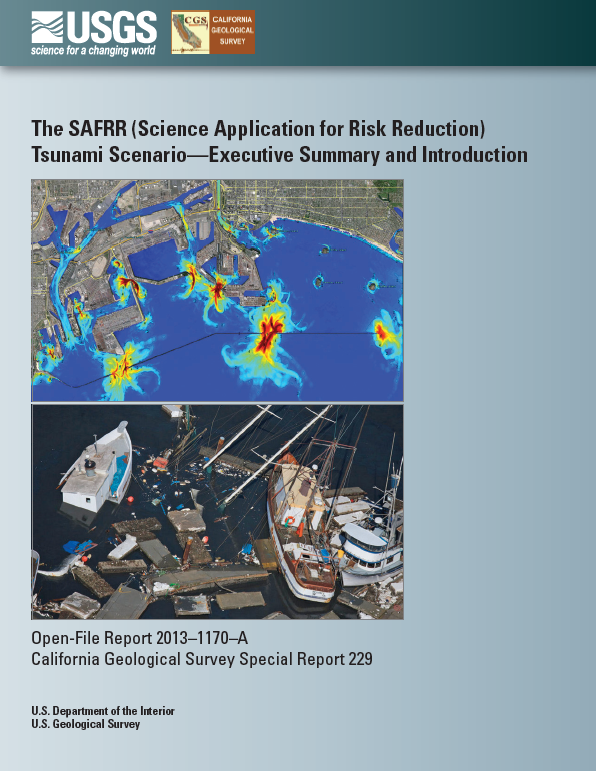 SPA continues to develop and release OpenRisk applications, in collaboration with the US Geological Survey, the Southern California Earthquake Center, and Instrumental Software Technologies, Inc. OpenRisk is a suite of object-oriented, web- and GUI-enabled, open-source, and freely available software code for conducting multihazard risk analysis. The resulting body of code and applications are all referred to as OpenRisk. For a brief overview, click here. For more detail, see www.risk-agora.org. August 2008. SPA announces SPARE (SPA Risk Estimation). SPARE is a new quick analysis application for estimating vulnerability functions. SPARE is the first module in SPA's development of a general risk analysis suite of applications. June 2008. SPA helps to develop the ShakeOut scenario. Scientists unveiled a hypothetical scenario describing how a magnitude 7.8 Southern California earthquake--similar to the recent earthquake in China--would impact the region, causing loss of lives and massive damage to infrastructure, including critical transportation, power, and water systems. Keith Porter led the overall assessment of physical damages, while Charles Scawthorn performed the analysis of fire following earthquake. In the scenario, the earthquake kills 1800 people, injures 50,000, causes $200 billion in damage, and has long-lasting social and economic consequences. One third of the economic loss is attributable to fire following earthquake, another third to shake-related property loss, and most of the rest to indirect losses associated with the interruption of water supply. Fatalities are approximately equally attributable to fire and shake-related damage. This is the most comprehensive analysis ever of what a major Southern California earthquake would mean, and is the scientific framework for what was the largest earthquake preparedness drill in California history, on November 13, 2008. More than 5 million people participated, including businesses, schools, numerous government agencies, and private citizens. Further information can be found here. SPA's analysis of fire following earthquake can be found here. Contact us for a private briefing on what your organization can learn from the ShakeOut scenario and how you can better prepare for the Big One.